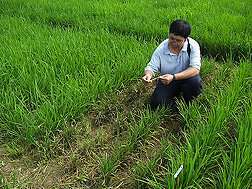 A never-before-described gene that gives rice resistance to a disease that has been costing about $66 billion a year in global damage has been isolated by a team of scientists led by Agricultural Research Service (ARS) plant pathologist Yulin Jia. Rice blast, caused by the fungus Magnaporthe oryzae, results in annual yield losses large enough to have fed 60 billion people each year, according to the team's paper just published in the journal Nature Communications. In the United States' mid-south rice-growing region, the cost of mitigating rice blast infection with fungicide applications can reach almost $20 per acre; plus, the fungus may still cause significant yield loss depending on the susceptibility of each rice variety and the degree of infection at the time of fungicide application, according to the U.S. Department of Agriculture's (USDA) Economic Research Service. Amazingly, Ptr, the disease resistance gene Jia and his team found, has a structure that has not been seen in plants before. It has been previously deployed unknowingly in blast-resistant rice cultivars because it has been tightly linked to another disease resistance gene, Pi-ta, which has a genetic structure that is well-described in scientific literature. Ptr has essentially been living in the shadow of Pi-ta. "Our research was able to separate the two genes and demonstrate that Ptr is independently responsible for its own broad-spectrum blast resistance without Pi-ta," says Jia. "This will provide a new strategy for developing blast-resistant rice cultivars." The full genomic sequence of the Ptr gene was put into GenBank for use by public researchers worldwide.